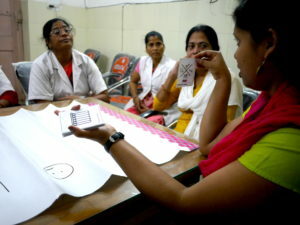 M4ID’s Lab.Our Ward project ran tests with a set of new tools in Samastipur district hospital, India. The aim is to increase the adoption of best practices in newborn and maternal care. Project lead Nicolas Von Flittner has been working with the Lab.Our Ward project for three years. Trying to get inside a newborn baby’s mind is a part of his job. The Lab.Our Ward team tested new tools in October. The Red Curtain booth was intended as an immersive experience, where people could step in, and learn about the ideal delivery journey. People could also experience what it’s like for a baby to first be inside a womb, and then to come out. The project aims to to improve birth facilities and related healthcare practices in low-resource settings. The team wants to make the experience safer and more comfortable for the baby and the mother. Flittner says that the area of work is well-researched, but there is still work to be done. 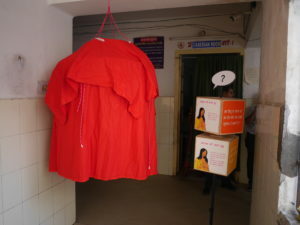 Last month, the team travelled to the state of Bihar in India to test new prototype equipment, including a fabric booth called “Red Curtain”, boxes attached to a pole, a card game and different mobile applications. “What we have learnt, is that often very small changes can make a big difference for the outcome”, Flittner explains. Through combining information and recommendations from the World Health Organisation and other organisations working in the field of maternal and newborn health, the team listed best practice guidelines for delivery, Flittner tells. One of the tools was a board game with cards. This is not an impossible list to follow, he explains. Knowing, what should be done, Lab.Our Ward team set find out, what would be the best way of conveying the information, and how medical staff, the mothers and their companions could be best reached. In October, the team created a number of concepts for tools, which could be used and displayed within medical facilities. For the testing phase, the team decided that it would be best to get first hand experience from the health care professionals themselves, in a real-life hospital. They decided to go to India. “We wanted to try the tools out in Bihar, a state, which has a dire need for maternal and child health services, and where we also had a great partner to work with”, Flittner tells. The tools developed for the testing phase all had a different purpose. It was also important to understand how the space was organized, and where everything was located. 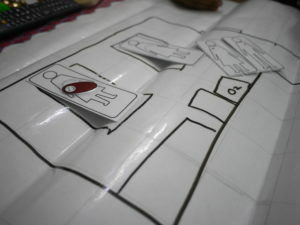 Drawing the space helped the medical staff see, how the delivery ward was organised and if workflow could be improved. Flittner explains that through this exercise, the staff could think about how to rearrange the space so as to enhance ergonomics and workflow and to prevent infections and other risks. The cubes and the booth were installed in the corridors, displaying information about the best practices. In addition, the team tested a set of mobile applications for information sharing. The learnings from India were collected, and next, the team will take the equipment to Nigeria. “We will re-run the tests in another setting, so that we can get more information, before making our decisions on how to revise the designs”, Flittner tells. “In the end, the aim is to build a set of solutions for a database, which any actor in the field is able to access and utilise, including service, product and space design solutions”. Stay tuned to hear more about the designs-to-be!